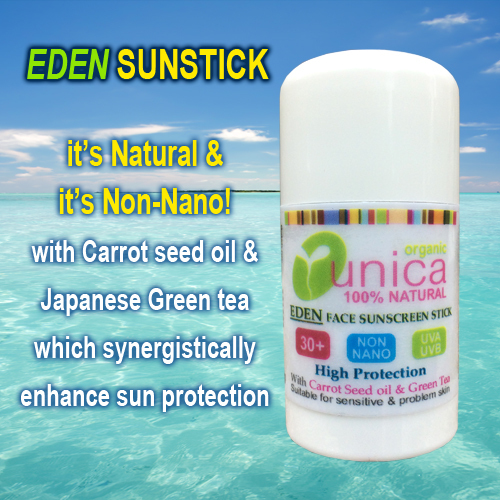 EDEN Organic SunStick - Organic & 100% Natural Sunscreen with Kakadu plum extract, Japanese green tea and Carrot Seed oil which synergistically enhance sun protection. It's Natural & It's Non Nano! Easy to use, handy and, abve all, no mess stick to protect lips, ears, nose, neck and other areas that are particularly vulnerable to sun damage. Nourishes and moisturises while protecting your skin. Our sunscreens are formulated with Non-Nano uncoated zinc oxide as the physical barrier against UV rays. Zinc oxide is the same ingredient used in calamine lotions and in nappy rash products. 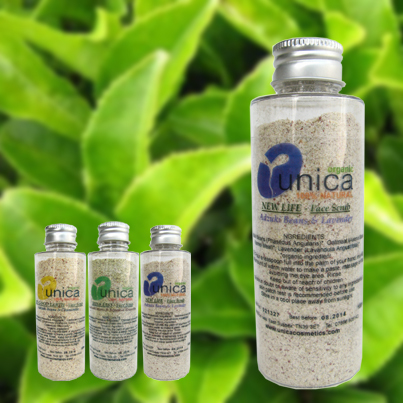 It is a powdered mineral that sits on top of the skin reflecting and absorbing both UVA and UVB rays. Why we use Non-Nano zinc oxide? 'If nanoparticles penetrate the skin they might facilitate the production of reactive molecules that could lead to cell damage...There is insufficient information about whether used in cosmetics (such as zinc oxide) penetrate the skin and there is a need for more research into this..."
At Unica we think that this a risk not worth taking. Our Eden organic sunscreens provide "Broad spectrum" protection, meaning that they offer protection from both UVB & UVA rays, without using questionable chemicals. Eden sunstick contains two awesome natural ingredients which synergistically enhance sun protection: Japanese Green Tea, another powerful antioxidant known for its anti-irritant properties and for preventing redness, rough skin and peeling caused by sun drenched skin; Carrot seed oil, antioxidant, antiseptic, antiviral and with a massive natural SPF of around 35. Eden organic sunstick also contains natural and organic plant oils which nourish, sooth and rejuvenate your sun exposed skin and, like Carrot Seed oil, also provide additional sun protection because of their natural SPF: Almond oil (SPF 4-6), Shea Butter (SPF 6-8) & Coconut oil (SP F4-10). Naturally scented with Lavender essential oil. 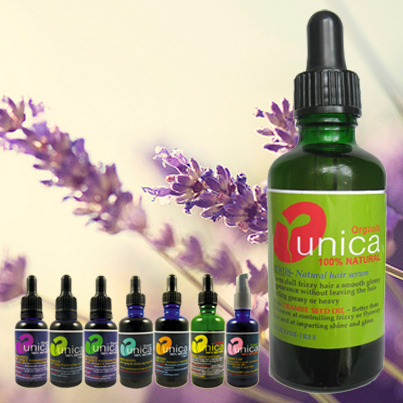 Are Unica organic sunscreens whitening? You should expect some whitening with any mineral-based sunscreens, unless it contains nano- particles. avoid direct sun particularly during the hottest four hours of the day (11.00am to 3.00pm in the UK and 12.00noon to 4.00pm on the Continent). SKIN TYPE: All skin types. Suitable for use on very sensitive and eczema prone skin and for children over 3 years old. USE: Twist base of stick anticlockwise. Apply to lips, ears, nose & other areas particularly vulnerable to sun damage. Re-apply frequently during exposure and after swimming. "A woman clothed with the sun, and the moon under her feet, and upon her head a crouwn of twelve stars"
Jaanese Green Tea is a powerful antioxidant known for its anti-irritant properties and for preventing redness, rough skin and peeling cause by sun drenched skin. Thanks to its high concentration of naturally occurring compounds called poliphenols, which are very potent antioxidants agents, green tea have been found to reduce cell damage caused by exposure to ultraviolet radiation. Green tea appears to protect from sun damage by quenching free radicals and reducing inflammation and therefore enhances and extends the effectiveness of sunscreens and ameliorate adverse skin reaction following UV exposure. Furthermore, green tea has also been shown to have powerful anti-irritant, anti-inflammatory and anti-bacterial properties. Carrot Seed is fantastic revitalizing and toning skincare agent and considered one of the best essential oils for mature skin. Carrot seed oil also assists in removing toxins and water build up in the skin giving it a fresher more firmer appearance. Carrot seed oil has also a detoxifying effect on the liver and cleans the digestive system and the body as a whole. It is helpful for arthritis, gout, edema, rheumatism and the accumulation of toxins in muscles and joints. Carrot seed oil carrot also provides natural sun protection with a natural SPF around 35. Shea butter is derived from the fat of the shea nut. Shea butter melts at body temperature and absorbs rapidly into the skin without leaving a greasy feeling. It contains the antioxidants, vitamins A and E both of which enhances skin cell regeneration and promote blood circulation below the skin’s surface. 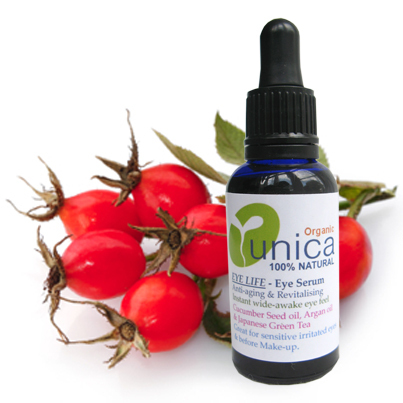 Cinnamic acid in the oil provides vital protection against harmful UV rays. Its rich emollient quality makes it excellent for very dry skin. SPF 6-8. Macadamia is known as the” king of nuts” and its oil is known to have almost the same properties as sebum. Sebum is the oil produced by our sebaceous glands to protect the skin from dryness and in a way makes skin and hair waterproof. Macadamia nuts provide vitamins, minerals and antioxidant fatty acids. Good sources of magnesium, iron, phosphorous, potassium and vitamin E, the oil from Macadamia nuts also contains a natural plant chemical called cinnamic acid which provides a variable SPF level of 6. Coconut oil has an amazing ability to heal the skin and block the damaging effects of UV radiation from the sun. One of the reasons why it is so effective in protecting the skin is its antioxidant properties, which helps prevent burning and oxidative damage that promotes skin cancer. There have been several recent studies done on the use of coconut oil as a sunscreen but there are fluctuations in the SPF rating of coconut oil. One study “proved” a rating of only 4 while another rated coconut oil at a 10.